It’s a known scientific fact that Indian food tastes good! Thanks to the abundance of spices and flavours. 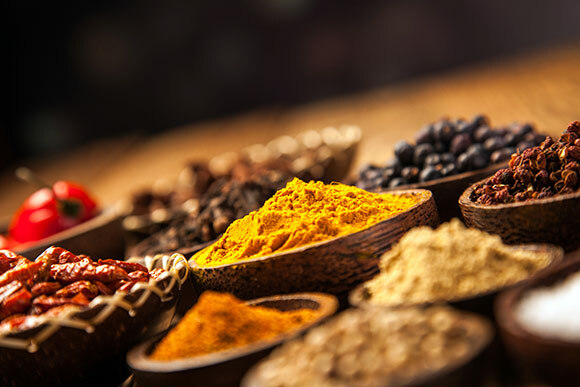 Indian cuisine offers plenty of variety with dishes ranging from North to South and sometimes by kitchen to kitchen. Punjabi, Bengali, Rajasthani, Goan, Gujarati, and Maharashtrian are just the tip of the delicious iceberg. The word “curry” has much more to offer than just an oversimplification of an Indian cuisine coined by the English. It uses a variety of spices (masalas) all individually added as you cook so that the mixture is much more unique and varying depending on the region and sometimes by the specific kitchen. We at Mantra have reinvented Indian food in a progressive way. The dishes are healthily packed with flavour, crunch, punch and zing offering plenty of choice to vegetarians and vegans.The menus are inspired by seasonal ingredients, the freshest produce, deliciously healthy ideas bringing amazing diversity of India’s regional cuisines and childhood street food memories offering plenty of choice to cater to all types of customers. Indulge in traditional Indian cuisine with us. Enjoy a lavish menu handcrafted by our experienced chefs and submerge yourself in the rich tastes and flavours of north as well as south Indian cuisine presented and prepared in a progressive technique. Right food, a Mantra for Healthy Life!!! 1. When ordering take out food please be aware that the restaurant is open from 12:00 – 3:00pm (Lunch) & 5:00pm – 11:00pm (Dinner). 2. Lunch time orders are for collection only. 3. A 10% discount will be applied to online prices, but a surcharge of £2.00 will be added to items delivered.